This is why we came to Myanmar! Mogok! This lovely isolated valley is the source of something like 90% of the world's rubies! This tour of Mogok was based in part on a 2013 field trip organized by Kyaw Thu and Dr. George Harlow of the American Museum of Natural History. Mogok is not easy to reach. Tourists can now visit but must buy a special permit from the government and hire a government approved guide to accompany the group. There is no airstrip, only two roads in and out. We flew into Mandalay then took the newer road from Pyin Oo Lwin to Mogok. It was about 6 hours and was a very rough journey. There are few places to stop for a restroom and the road is windy and in poor condition. Several of us got very carsick. Not a good time to be sick as we had an action packed schedule with twelve mines to visit as well as shops and gem markets. We arrived in Mogok on the evening of November 8. Our first group picture in Rubyland! The first mine we saw is Shunt-pan, a secondary ruby and sapphire mine owned by San Taw Wun Gems Co. 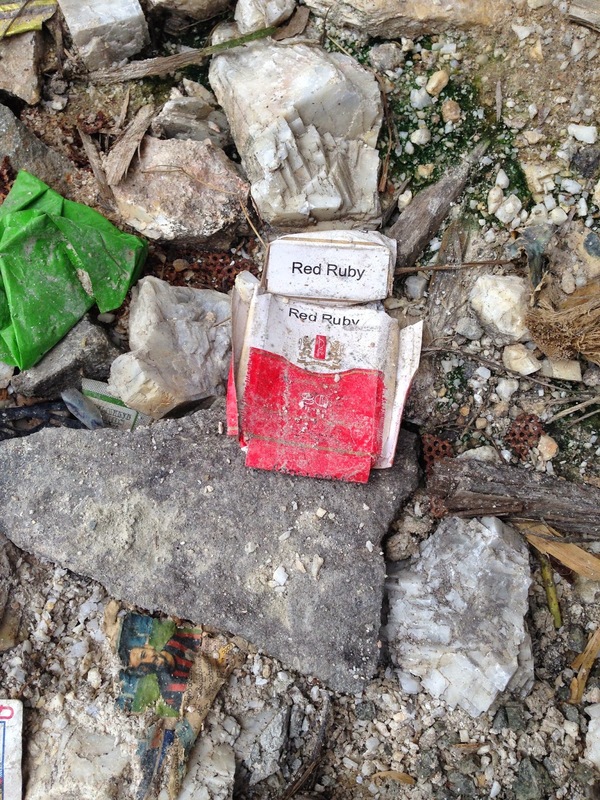 The ruby and sapphire mines in Mogok are either primary (rubies, etc. in the host rock, a marble) or secondary (rubies, etc. found in alluvial sediments). The sediments are washed with high pressure hoses and then sucked into pipes. Dangerous work. The pipes empty onto the sluices and the overflow is panned. The Director gave us a tour and showed us some of the material that they have found recently. Next stop was Lin-yaung-chi, both primary and secondary mine. The white rock in the foreground is the corundum bearing skarn and in the distance is the alluvium they are also mining. The (hopefully) ruby bearing marble is mined at depth, brought to the surface by pulley and then goes into the crusher. What brand do they smoke in Mogok? In the evening at the hotel a few dealers would stop by. Several people including Bob wanted peridot rough. These ladies had some beautiful rough but they wanted $150 a carat and would not (or could not) negotiate. That is a very high price, so no one bought peridot! Early the next morning (Nov. 10) we visit the home of a mineral dealer. Outside the monks are collecting alms. People in the town give food for lunch at the monastery. This is not charity but a part of Buddhism. Monks and nuns do not accept any money as gifts. People bring them food and medicine and gifts for the household. We saw some nice pegmatite specimens, this is a dirty but interesting intergrowth of quartz and topaz. As soon as we stepped outside a mob formed. Foreigners visiting Mogok are assumed to be gem buyers. People shove their wares in front of your face but are also very polite and quick to back off if you are not interested in what they have. This is a few blocks away at Aung Thit Lwin gem market (really just a gathering of dealers on a street corner). This is exhausting! People did end up buying some very nice minerals. Next a primary sapphire mine in Kyauk Saung, owned by PENTA Gem and Jewelry Co. Ltd and Myanmar Group Enterprise. Here at the office they are trimming sapphire rough before it is cut. The sapphires come from another mine they own, at Baw Mar. Cutting a sapphire on an old-fashioned foot pedal polishing wheel. He told us he prefers the foot pedal to the motorized polishers. A lovely bracelet modeled by the lovely Skip Simmons! They had some ruby rough as well, coming from Kyauk Saung. Let's visit the primary ruby mine in Kyauk Saung. Kyaw Thu leading us into the Kyauk Saung Mine. View to an ancient opening of the Kyauk Saung mine. Skip and the Kyauk Saung mine owner looking at the marble. Some of the miners of the Kyauk Saung mine. Some very happy Gem & Mineral Council members! Around 60 people work at the Kyauk Saung mine. On site, the worker's house align along the water. Women panning the tailings at the Kyauk Saung mine. And, of course, a well-deserved lunch at Daung Saing restaurant in Kyat pyin! The following large open sky mine is located in Inn Gaung, and is run by Hlan Shan company. It is mostly a secondary ruby and sapphire mine, but some good quality spinels are also found there. Depending on the season, 100 to 200 people work at the mine. We saw a lot of heavy equipment on site, and we have been told that 10 barrels of diesel per day are necessary to run the mine! 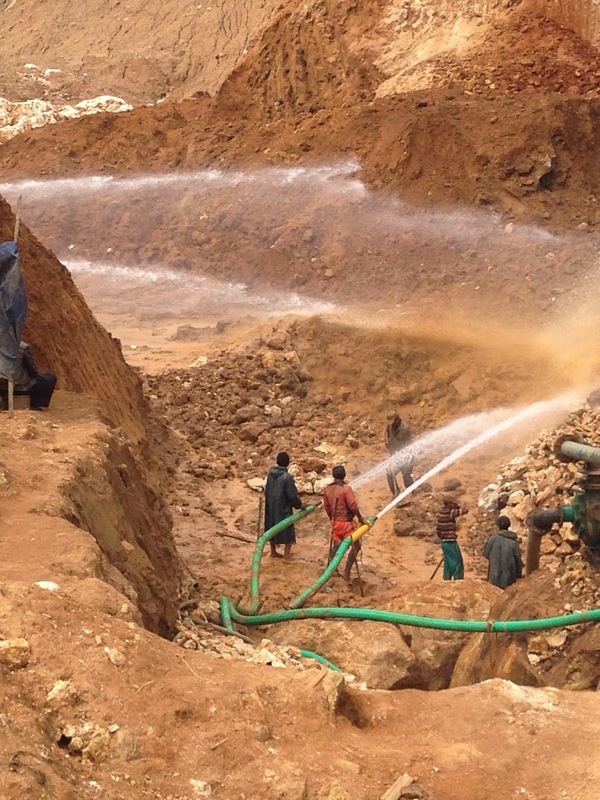 We were there just after the rainy season, the miners were mostly pumping the water out, and removing the overburden. The entrance of the mine in Inn Gaung. At each mine, the local geologist was telling us all about the mining processes. The map of the Inn Gaung mine. The washing process at Inn Gaung. On November 11, while most of you were taking a day off, we continue our visit of Mogok with another primary ruby and pink sapphire mine in Baw Lone Gyi, run by Htay Paing company. The operation consists in a huge tunnel, where trucks can fit in and navigate easily in the tunnels. We went down the tunnel to where the trucks could go as well, but the mine actually runs 600 feet deeper than the level we stopped at. The entrance of the Baw Lone Gyi mine. Looking some 600 feet down! Trucks can go far deep in the tunnel. At the same Baw Lone Gyi mine, the sorting area. 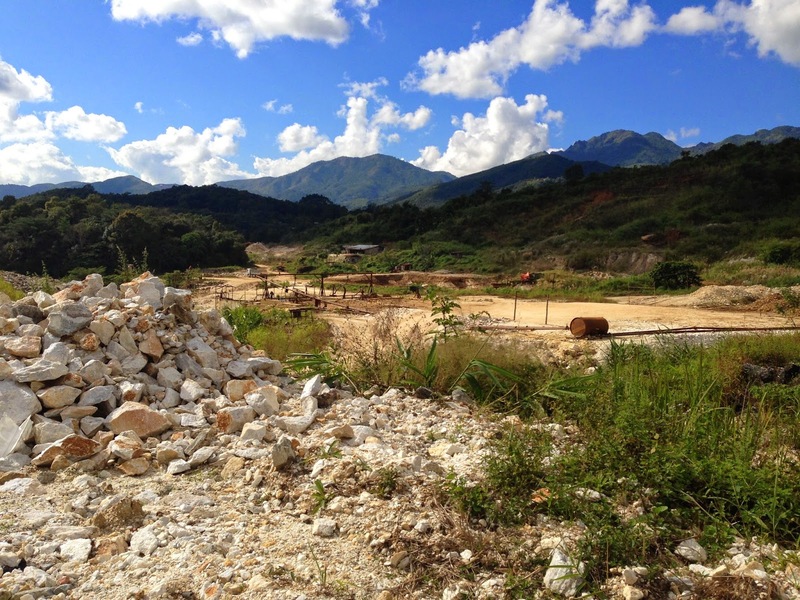 In Baw Lone Gyi village square, all ruby tailings are for public collecting. The people here are Palaung, one of Myanmar's many ethnic minorities. It is impressive to see such a place, covered in white (marble) pebbles. Women and children work the tailings, looking for any ruby, sapphires or spinel. Our next stop was at the old painite mining area, in Wet Loo. At this location, the first big and opaque crystals of painite were discovered back in 2008. It is at the contact of the leucogranite with the marble that the painite was found. The area is still mined though, but for the rubies in the marble. The abandoned painite mine in Kyauk-Pyat-That. And to end our day, we visited the Kyauk-Pyat-That Pagoda. Views from the Kyauk-Pyat-That Pagoda. At the bottom of the Pagoda, there were 2 shops selling minerals, including a card with a bunch of minerals for "beginner collectors". On each, there was a painite, so a few of our members bought some! And to end the day, some more minerals at the Pan Ma gem market. The next few days in Mogok in a following blog post!